The work Curtiss Fox is doing today at the University’s Energy Innovation Center on its Grid Simulator will change the way we power our nation, and even our world, tomorrow. CLEMSON, S.C. – When the lights flicker, we barely notice. Our homes stay warm. Our laptops switch to battery backup. Maybe an old clock radio needs a reset, but otherwise life goes on uninterrupted. In the world of distributed energy production, however, even a momentary disruption in power can be a big deal. Whether it’s something as small as a voltage fluctuation (think: a squirrel in a transformer or a tree falling on a power line) or something as significant as a cyber attack on the power grid, knowing how the next generation of energy will respond to these disruptions is vitally important. That’s where Curtiss Fox of the Clemson University Restoration Institute (CURI) comes in. The work he’s doing today at the University’s Energy Innovation Center (EIC) on its Grid Simulator will change the way we power our nation, and even our world, tomorrow. Fox, a Ph.D. candidate in electrical engineering, is working with powerful grid simulation technology at the Charleston-based testing facility, studying how to integrate the nation’s aging electrical infrastructure into more reliable, more energy-efficient systems. Even though he’ll accept his degree (his third from Clemson) in December, he’s already logged more than three years of notable work and research at the EIC, going a long way toward making alternative energy a real solution. Fox landed his stint at CURI in early May 2010, shortly after he’d finished up Ph.D. coursework on the University’s main campus. The Department of Energy had just awarded a grant to the drivetrain facility so that it could conduct mechanical testing of wind turbines by constructing two wind turbine dynamometers: one 7.5 megawatts, one 15 megawatts. The DOE grant had a specific purpose: to allow Clemson to perform Highly Accelerated Life Tests (HALT) on wind turbines — in layman’s terms, the tests are designed to simulate extreme events, those outside the turbine’s normal operating range, to see how they respond. These tests are important before the turbines are deployed to the field for obvious reasons, namely to prevent equipment failures and avoid expensive replacements on the highly technical equipment. 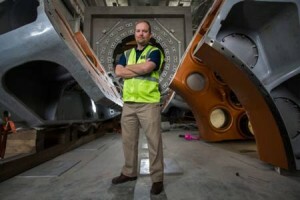 About the time the grant was awarded, Fox’s Clemson adviser, Randy Collins, associate dean of the College of Engineering and Science and professor of electrical and computer engineering, attended a presentation about the then-proposed wind turbine drivetrain testing facility. Collins spoke with EIC facility director and senior scientist, Nick Rigas, and learned about an electrical diagram of the proposed facility. On that diagram, there was a box. But no one quite knew what type of equipment was going to go into the box. Collins mentioned to Rigas that he had a grad student who could look into that for him. A few weeks later, Fox drove to Charleston. He met Rigas. He landed the job: grad assistant at CURI. Fox’s main objective: to figure out what kind of electrical equipment went into the box. He also was charged with designing power-flow studies and studying the transient response of the electrical equipment within the facility. So, Fox developed a 15MW Hardware-In-the-Loop (HIL) grid simulator to troubleshoot these kinds of power interruptions and reduce the risks that those in the energy industry worry as they try to integrate new technologies into the electrical grid. Since then, Fox’s work to bring HIL capability to the Energy Innovation Center has introduced a world-class, advanced testing platform capable of modeling grid conditions anywhere in the world. The grid simulator is a center for innovation, where energy efficiency, energy storage and smart-grid technologies can be developed, tested and certified before they are rolled out for the mass marketplace. All the while, the project has been an opportunity to educate industry about power systems engineering and to show them how it could impact their future workforces. This year Fox and his colleagues filed a U.S. patent on the grid simulator while also successfully defending his dissertation on Low Voltage Ride-Through technology. The grid simulator project is now a separate, Department of Energy-sponsored project supported in large measure by corporate partners including Duke Energy and SCANA. “As a student, I have been allowed to collaborate directly with industry,” Fox explains. J. Curtiss Fox received his bachelor’s (2005) and master’s (2008) degrees in electrical engineering from Clemson. Originally from Summerville, Fox moved back to the Lowcountry to help with Clemson University’s new wind power technology efforts at the Clemson University Restoration Institute. In 2013, Fox was awarded the Young Energy Leader Award from the Charlotte Business Journal, making him the first individual from South Carolina to win the award.